ABC’s on-air Oscar promos starring co-hosts Anne Hathaway and James Franco have thus far been pretty cute and firmly neutral. But the spots making the rounds on the Internet are a different story. The “Grease” themed montage is just a bit of a “why?” moment. 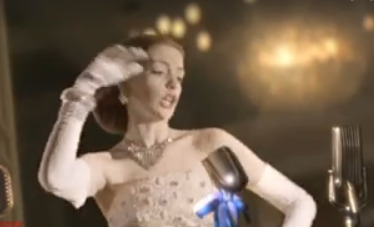 The “Evita” spoof, which has Hathaway shaking her booty (literally) on a balcony, is harder to watch. Hathaway is a classical actress who has shown some comedic chops, but she’s not slapstick. This bit might have worked for Kathy Griffin. God bless Hathaway for committing, but it’s not working. Why is that so important? Well, doubting the ability of the host or hosts is always part of the run-up to the Oscars. But because are Hathaway and Franco are so young, they’re under twice the scrutiny. And speaking of how young they are — why are the show’s promo writers’ only two ideas based on movies that came out decades ago? Hathaway and Franco are modern Hollywood defined — there’s nothing fun about pushing them into old packaging. Choose your own awkward video adventure below.